Surrounded by a landscaped park ( 5000 sqm ) with mature trees , this picturesque , fully restored stone house built in the 19th Century in which there are three charming apartments and a bit away from the main house two picturesque single family homes . All apartments have separate entrances and direct access from the living room into the romantic garden , a private outdoor patio, garden furniture and sun loungers , fly screens + fans. Of course, it is not missing the oval pool 10 x 5 m, surrounded by a Mediterranean palm garden. A large sand play area with climbing and rocking equipment is available. Other positive things : satellite TV and bicycles, washing machine , biol.Olivoil and wine ( own production) , bread service, on request our legendary Tuscan evening with 4-course menu , in the winter, a Christmas tree ready , dogs are welcome. We speak English , Italian , German. W-Lan free of charge. Directions : You will pass on the highway from north to Pisa Livorno + , always towards Rome - Grosseto . In Rosigniano Marittima is the highway to the end ( toll booth ) . From there go on the SS1 ( expressway ) Tailgating, direction Grosseto until exit Gavorrano scalo . Please do not previously left towards Gavorrano and Bagno di Gavorrano ! Now , follow the directions Ravi . On this Country Road (old Aurelia SS1 ) ca. 7 km drive , then comes Bivio Ravi , shortly after there is a roundabout , not turn here after Ravi , situated on a mountain top , but continue 1km straight towards in direction Grosseto until shortly before a Total petrol station ( clue ) , right here the 2.turn to Ravi. Then from there exactly1300m go on this small road until on the left is a gravel road. Please turn,after about 50m then turn to the left into the courtyard of La Fornace . Finally! Welcome . Culture: For art and culture lovers is so much offered that a holiday certainly not sufficient to have seen it all. Since we are in the center of the ancient Etruscan civilization in the middle , it is to excavations , ancient sites not far , for example, Vetulonia , Populonia , Roselle , Vulci , Tarquinia , etc. Of course, the dream cities Massa Marrittima , Siena , Florence and Its museums are not to be forgotten. Even the magnificent city of Rome you can visit for a day excursion from here. Who more indulges in sports and leisure activities , here comes probably also at his own cost . In 15-20 minutes you are right on our beautiful coastline with miles of wide sandy beaches, as they exist in Castiglione and Punta Ala, romantic beaches , picturesque little coastal towns , with a large sports facilities and a funky nightlife. Those who want to dine like king of Italy ' and taste our excellent wine , here from the small trattorias to gourmet temples anything can beat a gourmet 's heart beat faster . We are a German / Italian couple who is born in Erding one part, the other in Florence ... from this Bavarian-Tuscan alliance was created with much love, energy and creativity of our little paradise that we now more than 20 years like to share with our guests ..., o)) We live and work here on our property, my husband is a farmer and cherishes and maintains his 380 olive trees, and produces an excellent organic olive oil. Die freundlichen Gastgeber wohnen ganz in der Nähe und helfen stets bei Problemen oder Fragen. Der kleine Swimming-Pool wird gut unterhalten. Wir genossen kürzere und längere Ausflüge ans Meer und ins Landesinnere, wobei man auf das Auto angewiesen ist. Als Gäste zum "toskanischen Abend" eingeladen zu werden, an dem wir Urlauber mit einem selbst zubereiteten 4-Gänge-Menü der Gastgeber verwöhnt wurden und vor Ort die selbst produzierten Weine und das Olivenöl verköstigen dürften, rundete den Urlaub vollends ab. Als sehr angenehm empfanden wir auch die Temperatur im Haus (und das ohne Klimaanlage), den großen gepflegten Poolbereich, der für jeden Gast genügend schattige Plätze bereit hält und die gut ausgestattete Küche. Wir werden bestimmt wiederkommen, da wir noch längst nicht alles erkunden konnten, was die Umgebung bietet und uns einfach rundum sehr wohl gefühlt haben! Vielen Dank, liebe Bernice und lieber Emiliano! Herrlicher Urlaub im Podere "La Fornace"
Voller Erwartung sind wir als Familie in die Toskana gefahren und wir fanden ein traumhaftes altes Landhaus vor in einer wunderschönen von Olivenbäumen umgebenen Parkanlage vor. Als wir in die Wohnung "primo" traten, waren wir total begeistert von der Wohnung mit schöner Einrichtung und einem herrlichen Kamin. Wir haben in der Morgensonne auf der Terrasse draußen mit Blick in den Olivengarten gefrühstückt und abends noch gerne während des Grillens bei leckerem Wein von Bernice und Emiliano auf der Terrasse gesessen. Die Gegend eignet sich optimal für schöne Mountainbiketouren. Wir haben dabei wunderschöne Strände erreicht, die im Gästebuch von Bernice und Emiliano vorgeschlagen sind. Mit dem Zug konnten wir außerdem wunderbar Rom für einen Tag besichtigen. Von Bernice haben wir viele schöne Vorschläge für Unternehmungen erhalten. Bernice und Emiliano waren die ganze Zeit hilfsbereit und sehr gastfreundlich. Wir haben uns rundum wohl gefühlt und freuen uns schon auf unseren nächsten Urlaub im Podere "La Fornace" im nächsten Jahr. Wir hatten zwei wunderschöne Wochen in einer mit viel Fingerspitzengefühl eingerichteten Ferienwohnung.Wir haben uns gleich zu Hause gefühlt und konnten uns sehr gut entspannen. Dazu beigetragen hat sicherlich das traumhafte bepflanzte und gepflegte Grundstück (Emi und Bernice geben alles dass das auch so bleibt ),unser Frühstück im Garten in der Sonne,unsere Schmöckerstunden am Pool,unser abendliches Schlückchen Etrusco Wein natürlich vom Podere -es gibt so viel zu entdecken und zu probieren! Die Umgebung ist wunderschön,die Strände auch-ein perfekter Ort für einen Urlaub! Im Sommer dürfen wir wieder das Paradies mit Bernice und Emi teilen,wir freuen uns auf Euch bis bald! Unser Urlaub in der Toskana, in dem wunderschönen Ferienhaus von Bernice und Emiliano, war vom ersten Moment an traumhaft. Die Vermieterin hat sich sehr bemüht, vorher schon mit mir in Kontakt zu treten und hat uns mit vielen nützlichen Tipps versorgt. Die Wohnung ist sehr gemütlich, mit einem wunderschönen Balkon, der zum Frühstücken einlädt. Dazu war sie außerordentlich sauber. Wir waren im März da, hatten aber unglaubliches Wetter, die Sonne hat uns jeden Tag ins Gesicht gelacht und uns in die tolle Umgebung entführt. Das Meer war nicht weit entfernt und in der direkten Umgebung, gibt es viele Olivenbäume und schöne, grüne Wege zum spazieren. Tausend Dank für die famose Zeit. Ich hoffe, dass wir uns bald wieder sehen!! Ravi is a small, very picturesque village on a hill and is located in an unspoiled , sparsely populated landscape,still largely untouched by mass tourism. This part of Tuscany called Maremma, which is so characteristic with his evergreen maquis , which is unique in its wild beauty . 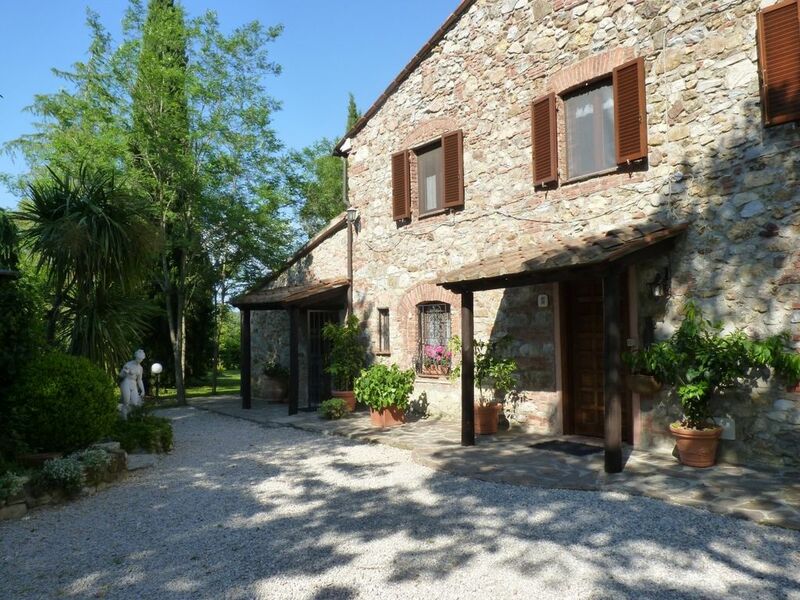 Below the mountain village of Ravi , about 15 minutes drive from the sea ( Castiglione della Pescaia) , is the stone house La Fornace , fully integrated into nature . Surrounded is our country house of 5 acres of land with olive trees and meadow. In Ravi , 2 km from the house , you will already find the first of several excellent restaurants. Some trails go directly from the house into the bush forest of cork oak and chestnut forests. The German / Italian owner ( always in a good mood and full of energy ) , which inhabit their small house on a neighboring property , always have an open ear and the best insider tips for their guests ready. Especially popular are the Tuscan Maremma evenings with specialties from Mama Alba, good wine , music and candlelight. Golf : Approx. 10 minutes drive from La Fornace away is the beautiful newly designed golf Club Toscana with 18 holes . In about 30 minutes you reach one of the most beautiful golf courses in Italy , if not Europe, the Golf Club Punta Ala . This 18 -hole course is nestled in the oak groves by the sea with breathtaking views. Die Endreinigung von € 40 ist im Mietpreis nicht enthalten. Für die Heizung ( nur bei Bedarf) erheben wir einen Aufschlag von € 10.-pro Tag Bettwäsche und Handtücher bei Ankunft vorhanden Hunde kosten € 60.- für den gesamten Aufenthalt Per la pulizia finale sono 40 € da pagare. per il riscaldamento sarà addebitato un supplemento di € 10.-al giorno. Biancheria da letto e da bagno sono disponibile all'arrivo. I cani costano € 60.- per l'intero soggiorno.